The Oyster card is a form of electronic ticketing used on public transport in Greater London in the United Kingdom. 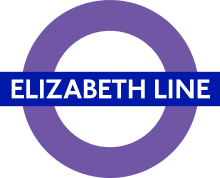 It is promoted by Transport for London and is valid on travel modes across London including London Underground, London Buses, the Docklands Light Railway (DLR), London Overground, trams, some river boat services, and most National Rail services within the London fare zones. The card was first issued to the public in July 2003 with a limited range of features and there continues to be a phased introduction of further functions. By June 2012, over 43 million Oyster cards had been issued and more than 80% of all journeys on public transport in London were made using the card. As part of TfL's "Future Ticketing Programme" the Oyster card platform is due to be replaced by a contactless payment card system, the first stage of which is due to be completed by June 2015. The Oyster card was set up under a Private Finance Initiative (PFI) contract between TfL and TranSys, a consortium of suppliers that included EDS and Cubic Transportation Systems (responsible for day-to-day management) and Fujitsu and WS Atkins (shareholders with no active involvement). The £100 million contract was signed in 1998 for a term of 17 years until 2015 at a total cost of £1.1 billion. The Oyster name was agreed on after a lengthy period of research managed by TranSys and agreed by TfL. Several names were considered, and Oyster was chosen as a fresh approach that was not directly linked to transport, ticketing or London. According to Andrew McCrum, now of Appella brand name consultants, who was brought in to find a name by Saatchi and Saatchi Design (contracted by TranSys), Oyster was conceived and promoted because of the metaphorical implications of security and value in the component meanings of the hard bivalve shell and the concealed pearl, the association of London and the River Thames with oysters, and the well-known travel-related idiom "the world is your oyster". A damaged card, revealing the microchip in the lower right corner and the aerial running around the edge of the card. The Oyster card has a claimed proximity range of about 80 mm (3 inches). The card operates as a RFID system and is compatible with ISO/IEC 14443 types A and B. Oyster readers can also read other types of cards including Cubic Go-Cards. From its inception until January 2010, Oyster cards were based on NXP/Philips' MIFARE Classic 1k chips provided by Giesecke & Devrient, Gemalto and SchlumbergerSema. Since December 2009 all new Oyster cards use MIFARE DESFire EV1 chips. From February 2010 MIFARE Classic-based Oyster cards were no longer issued. MIFARE DESFire cards are now widely used as transport smartcards. In 2008 a fashion caught on for removing the RFID chip from Oyster cards and attaching it to wrist watches and bracelets. This allowed commuters to pass through the gates by "swiping" their hand without the need to take out a proper card. Although the RFID chips were charged in the normal way and no fare evasion was involved, TfL disapproved of the practice and threatened to fine anyone not carrying a full undamaged card, though it is not clear what the actual offence would be. Oyster cards obtained at stations or shops cannot be fully registered online. However, cards can be protected online by setting up an Oyster online account and linking the card to that account. This allows for a full protection against theft or loss, but the Oyster card will be able to hold only 7-day season tickets and/or pay-as-you-go. The cards were originally free, but a refundable deposit of £3 was subsequently introduced, increased to £5 if you want a refundable oyster card in January 2011. The deposit and any unused credit is refundable by posting the card to TfL; however, refunds are paid only by pounds sterling cheque, bank transfer to a UK bank account, credit to another Oyster card, or a TfL web account voucher, and refunds of over £15 require the customer to provide proof of identity and address. Refunds of up to £10 in credit plus the deposit may be claimed at London Underground ticket machines, which will pay the refund in cash. A complete 8-week 'touch' history can be requested from TfL: for registered and protected Oyster cards, TfL can provide the history for the previous 8 weeks, but no further back. Oyster online also displays up to 8 weeks of journey history but will not show any transactions that occurred before the Oyster card was linked to the account. Travellers touch the card on a distinctive yellow circular reader (a Cubic Tri-Reader) on the automated barriers at London Underground stations to 'touch in' and 'touch out' at the start and end of a journey (contact is not necessary, but the range of the reader is only a few mm). Tram stops and buses also have readers on the driver/conductor's ticket machine, and on these modes passengers must touch their card to the reader at the start of their journey only. 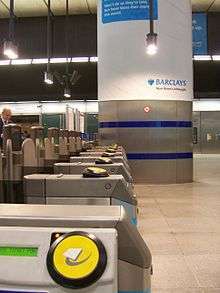 Most DLR stations and occasionally London Underground stations such as at Waterloo (for the Waterloo & City line) do not have automatic barriers so passengers must touch their card on a reader at both the beginning and end of their journey if they wish to avoid being charged the maximum fare for an unresolved journey. Such a step is not needed if transferring between trains within a station unless they are run by different operators. An Oyster card can hold up to three season tickets at the same time. Season tickets are Bus & Tram Passes or Travelcards lasting 7 days, 1-month, or any duration up to one year (annual). Although TfL asks all Oyster users to swipe their card at entry/exit points of their journey, in practice Travelcard holders only need to "touch in" and "touch out" to operate ticket barriers or because they intend to travel outside the zones for which their Travelcard is valid. As long as the Travelcard holder stays within their permitted zones no fare will be deducted from the pay as you go funds on the card. The Oyster system checks that the Travelcard is valid in the zones it is being used in. If users travel outside the valid zones of their Travelcard (but within Oyster payment zones), any remaining fare due may be deducted from their pay-as-you-go funds (see below for how this is calculated). From 22 May 2011 Oyster Extension Permits (OEPs) were no longer required. Before that date, users who travelled outside the zones of their Travelcard, and whose journey involved the use of a National Rail service, were required to set an OEP on their Oyster card before travelling, to ensure that they paid for the extra-zonal journey. Oyster card Travelcards can be renewed at the normal sales points and ticket machines at London Underground or London Overground stations, Oyster Ticket Stop agents, or some National Rail stations. Travelcards can also be renewed online via the Oystercard website, or by telephone sales from TfL; users must then nominate a Tube or overground station where they will swipe their card in order to charge up the card with the funds or season ticket purchased. Alternatively a user can choose to automatically add either £20 or £40 every time the balance on the card falls below £10. There are further restrictions on when an online purchase can be "collected" by swiping in at a station, after the date of online purchase (Travelcard: up to five days before start date until two days after the start date; pay as you go: from the day after order is placed for a total of 8 days). If the fare is purchased online before 23:00, it will be available the following day. For more Travelcard renewal information, see the section on Recharging in this article. Travelcard renewals cannot be added from a reader on a bus. An example journey would be Watford Junction to Richmond, which as of May 2010 costs £7.30 peak and £4.80 off-peak when travelling via Zone 1. If travelling on a route outside Zone 1 via Willesden Junction, the fares are £3.50 and £1.30 respectively, which can be charged correctly if the Oyster card is validated at the pink validator when changing trains at Willesden Junction. Passengers enter or exit most London Underground stations through ticket barriers which are operated by swiping an Oyster card or other valid ticket. Some tube stations (such as those at National Rail interchanges) and DLR stations have standalone validators with no barriers. In both instances, pay-as-you-go users are required to touch in and out. London Overground services are operated by TfL and Oyster pay-as-you-go users use their cards in the same way as on Underground journeys, touching their card on a card reader at the entry and exit points of their journey to calculate the fare due. Users must touch the Oyster card only once at the point of boarding: as London buses have a single flat fare of £1.50, there is no need to calculate an end point of the journey. As London buses do not accept cash payments, TfL introduced a "one more journey" policy on Oyster cards. This meant that customers are able to take a bus if their cards have £0 or more. This may take the balance into negative, but it can be topped up at a later date. Some London bus routes cross outside the Greater London boundary before reaching their terminus. Pay as you go users are permitted to travel the full length of these route on buses operated as part of the London Bus network, even to destinations some distance outside Greater London. 'London Service Permit' Routes 402 and 477 have a reduced cash fare of £1 within Greater London which applies when an Oyster card with PAYG is shown. However, Oyster cards with Bus Passes and Travelcards loaded on them and Child Zip cards can be used free inside Greater London on Route 477 and to Knockholt Pound on Route 402. Hertfordshire bus route 84 from New Barnet to St. Albans via Potters Bar, as of 2 January 2012, no longer has any Oyster Card or contactless payment card validity on any part of the route, cash fares only. The buses are still red-liveried, but the destination displays are dot-matrix rather than TfL blinds, and there are no TfL roundels on the bus. As London's trams operate on the same fare structure as buses, the rules are similar and users with pre-pay must touch the Oyster card only once at the point of boarding (users with Travelcards valid for the Tramlink zones need not touch in unless travelling to Wimbledon with a Travelcard not valid in zone 3). A more complex arrangement exists at Wimbledon; tram passengers starting their journey at Wimbledon must pass through ticket gates in order to reach the tram platform, and therefore need to touch their Oyster card to open the barriers. They must then touch their Oyster card once again on the card reader on the Tramlink platform to confirm their journey as a tram passenger. Tram passengers arriving in Wimbledon must not touch out on the card reader on the Tramlink platform but must touch-out to exit via the station gates. If the card is touched on the platform, the touch-out at the gate would be seen as a touch-in and cause the maximum cash fare to be charged to the card. Oyster pay-as-you-go is valid only to purchase tickets for London River Services boats operated by Thames Clippers. Pay-as-you-go is not accepted for payment by other riverboat operators. As with Underground and DLR journeys, Oyster PAYG users on National Rail must swipe their card at the start and end of the journey to pay the correct fare. PAYG funds may also be used to cover any additional fares due from season ticket holders who have travelled outside the valid zones of their season ticket (see Travelcards above). At a number of Tube, DLR, London Overground and National Rail stations which lie in close proximity, or where interchange requires passengers to pass through ticket barriers, an Out of Station Interchange (OSI) is permitted. In such cases, the card holder touches out at one station and then touches in again before starting the next leg of the journey. The PAYG fares are then combined and charged as a single journey. Examples include transferring between the Jubilee line at Canary Wharf and the DLR where Oyster card holders must swipe their card at the ticket barriers in the Tube station, and then touch in on the validator at the DLR station. Balham (National Rail) to/from Balham (Tube) is another OSI, as is Camden Town (Tube) to/from Camden Road (London Overground). Failure to touch in or out on the validators in these circumstances will incur a maximum fare which is deducted from PAYG funds. In some cases (e.g. at West Hampstead NR stations) the OSI replicates interchanges which have existed for several decades before the invention of the Oyster system but were generally used with season tickets rather than day tickets. Out of Station Interchanges can be temporary or permanent. A temporary arrangement may exist between two stations at short notice (routinely during weekend work but also when an emergency closure occurs). The two journeys that result are only charged as a single journey. PAYG funds and Travelcard season tickets (but not Bus & Tram Passes) can also be purchased online via the Oyster online website or by calling the Oyster helpline; users must then select one station or tram stop where they will validate their card in order to load the funds or Travelcard purchased. This should be done as part of a normal journey to avoid the risk of paying an Oyster maximum fare. If the customer is purchasing PAYG, the top up will be at the gates of their nominated station, or Tramlink stop the next day (ready for first train, provided they made the purchase before 11 PM the previous night). It will remain at the gates for 7 further days before dropping off the system. If the customer purchases a Travelcard season ticket, it will 'arrive' at the gates, up to 5 days before the start date of the ticket and will remain there until 2 days after the ticket has started. If the customer does not make their pick up in time, it will take a further 14 days to refund automatically to the bank card they made the purchase with. 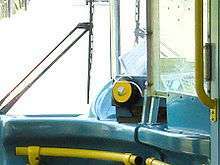 Top-ups of this type cannot be added from a reader on a bus. A replacement for lost/stolen cards costs £15 and involves applying for a replacement card online or by calling the Oyster helpline. A new photograph is not required. The funds/remaining travel is non-transferable to a new student Oyster photocard and is refundable instead. The refund of a lost/stolen Oyster card is based on the original pro-rata daily rate. Thus if you lose an annual student Oyster, the refund will not cover the remainder of the year due to the higher monthly/weekly pro-rata charges for the remainder of the year. This can leave students at a considerable disadvantage (adults can receive a replacement card with the remainder of their Travelcard loaded). On 7 January 2008, Transport for London unveiled the Zip card, a free Oyster photocard to be used by young people aged 18 years or under who qualify for free bus and tram travel within the capital, with effect from 1 June 2008. To qualify, one must live in a London borough (and still be in full-time education if between 16 and 18). Children outside London (and indeed the UK) may also apply for a Visitor version of the Zip card (which offers free bus and tram travel for under 16s, and half-rate fares for 16–18-year-olds) online, which they must collect from one of TfL's Travel Information Centres. From 1 September 2010 a fee of £10 has been charged for the card. Residents who are over 60 but who do not qualify for a Freedom Pass can obtain a similar 60+ Oyster Card for a single fee. The outer boundary of the area in which Freedom Passes and 60+ Oyster Cards can be used is mostly the same as the area within which ordinary Oyster Cards can be used. However, there are notable exceptions: Oyster 60+ and Freedom passes are valid to both Dartford and Swanley stations, to which non-concessionary Oyster cards are invalid on train services but can be used on TfL bus services. This comes about because although both stations are outside Greater London, both Dartford and Swanley have expanded sufficiently that parts now technically lie inside the Greater London boundary, though their postal addresses are still 'Dartford, Kent' and 'Swanley, Kent' respectively. Residents of these areas are entitled to an Oyster 60+ or Freedom pass as appropriate and require access to a local station to use them. Also Oyster PAYG cards can be used to Broxbourne station but Freedom Passes and 60+ Oyster cannot be used north of Turkey Street or Enfield Lock stations. This is solely because National Express East Anglia Railways has taken a decision to accept Oyster PAYG as far as Broxbourne. Both types of concessionary card have to be visually inspected at stations not equipped to read Oyster Cards. Cards also have to be visually inspected on any non-TfL buses whose routes accept the concessionary cards on journeys partly entering Greater London including routes equipped with readers that accept the national standard ITSO bus pass cards with which Oyster is not compatible. = Heathrow Connect: Not valid between Hayes and Harlington and Heathrow Airport. Certain limitations remain on National Rail, however; Oyster PAYG is not valid anywhere on Heathrow Express, Heathrow Connect between Hayes and Harlington and Heathrow Airport. Other airport express services Stansted Express and First Capital Connect Luton Airport services) all run outside the Travelcard zones, so PAYG is not valid on those services either. (Pricing correct as of May 2015) The single Oyster fare for a bus journey is £1.50, but capped at £4.40 for any number of trips in a day (including trips by Tram and tube). Cash is no longer accepted on London's buses, but a contactless debit or credit card can be used in place of an Oyster card at the same fare. A single tram journey is charged as per a single bus journey, but the tram ticket machines do still accept cash (£2.40) for a single journey. A 'capping' system was introduced on 27 February 2005, which means that an Oyster card will be charged no more than the nearest equivalent Day Travelcard for a day's travel. The daily cap in September 2014 was £7 during off-peak hours and £8.40 during peak hours within zones 1-2, providing that the card has been touched in and out correctly for all rail journeys. A lower cap of £4.50 applies if the day's journeys are restricted to buses and trams only. Price capping does not apply to PAYG fares on London River Services boats and on Southeastern high speed train services. Holders of Disabled Persons, HM Forces, Senior, 16–25 National Rail Railcards and Annual Gold Cards (as of 23 May 2010) receive a 34% reduction in the off-peak PAYG fares and price cap; Railcard discounts can be loaded on at London Underground ticket machines (with help from a member of staff). Disabled Person Railcard holders can also purchase an Off-Peak Day Travelcard for one accompanying adult for £3.00. 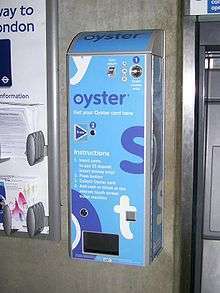 In order to prevent "misuse" by a stated 2% of passengers, from 19 November 2006 pay as you go users are automatically charged the "maximum Oyster fare" for a journey on that network when they touch in. Depending on the journey made, the difference between this maximum fare and the actual fare due is automatically refunded to the user's Oyster card upon touching out. The maximum fare is automatically charged to a passenger who touches out without having first touched in. Maximum Oyster fares may be contested by telephone to the Oyster helpline on 0343 222 1234. This involves providing the Oyster card number and the relevant journey details; further journeys appearing on the card are helpful to validate the user's claim. If the claim is accepted then the maximum Oyster fare minus the cost of the journey will be refunded. The user will be asked to nominate and make a journey from a specific Tube, DLR, London Overground or National Rail station, or Tram stop. On touching in or out, the refund is loaded to the card. The customer should make the pick up as part of an actual journey. This is because when they touch the reader with their Oyster card, not only will the refund go on to the card, but a new journey will start. Transport for London started accepting contactless debit and credit cards on London Buses on 13 December 2012, with the aim of expanding the new system to other transport modes by 2013. Transport for London further expanded the use of contactless cards to the Underground, Tram and the Docklands Railway from September 2014. It is reported that TfL's long-term aim is to stop handling money and collecting fares altogether. The same requirement to touch in and out on underground services applies to contactless cards. The same price capping that applies to the use of Oyster cards applies to the use of contactless cards (provided the same card is used for the day's journeys). The fare paid every day is settled with the bank and appears on the debit or credit card statement. Detailed usage data is written to Transport for London's systems and is available for customers who register their contactless cards with Transport for London. Unlike an Oyster card, a contactless card does not store credit (beyond the holder's credit limit) and there is no need or facility to add credit to the card. On 8 June 2015, Apple and TfL confirmed that it would start accepting Apple Pay as another form of payment on its network from July 2015 onwards. The fares would be same offered by Oyster and contactless. The official Oyster branded holders have only been redesigned twice, keeping up with various versions of the Oyster card. However, in 2007 the Oyster card wallets were redesigned and are now black. In March 2007 the Oyster card holder was redesigned by British designers including Katharine Hamnett, Frostfrench and Gharani Strok for Oxfam's I'm In campaign to end world poverty. The designer wallets were available for a limited period of time from Oxfam's street teams in London who handed them out to people who signed up to the I'm In movement. Also, to celebrate 100 years of the Piccadilly line, a series of limited edition Oyster card wallets were commissioned from selected artists from the Thin Cities Platform for Art project. Any new Oyster cards are now given with black wallets that display the Oyster logo and the Transport for London roundel. The previous wallets handed out were sponsored by Ikea who also sponsor the tube map, and did not display the Oyster or the London Underground logos. 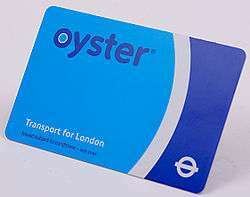 The standard public Oyster card is blue but colour variants are used by transport staff. One Day Bus and Tram Pass. Green. Introduced in January 2015, this Oyster card can only be used for a maximum of one day, and can not be reloaded with credit. About half the thickness of a standard Oyster card, as it is meant to be discarded when it expires. 2007 Tutankhamun and the Golden Age of the Pharaohs exhibition. Card users sometimes forget to touch in or touch out, are unable to find the yellow readers or it may be too crowded to touch out. Such card users have either received penalty fares by revenue inspectors, been charged a maximum cash fare, or been prosecuted in courts which can issue high penalties. Card users are also penalised for touching in and out of the same station within a two-minute period. Holders of Travelcards can add pay as you go credit on their Oyster cards. This credit is used as 'extension fare' when the Oyster user travels beyond the zones in which their Travelcard is valid. This extension fare equals the regular Oyster fare for a journey from/to the respective station outside of the validity area of the Travelcard to/from the closest zone still covered by the Travelcard. To distinguish between Peak and Off-Peak fares, however, the start of the journey is taken into account. That means a traveller might be charged the (more expensive) peak fare as extension fare even if they had not yet left the area of validity of their Travelcard by the end of peak time. Conversely, however, a journey starting in the covered zones shortly before the start of the peak time will be charged as off-peak. As yet, there have been no reports of customer data being misused, outside the terms of the registration agreement. There have been no reports of Oyster data being lost. The Mifare Classic—which is also used as a security pass for controlling entry into buildings—has been criticised as having very poor security, and NXP criticised for trying to ensure security by secrecy rather than strong encryption. Breaching security on Oyster cards should not allow unauthorised use for more than a day, as TfL promises to turn off any cloned cards within 24 hours, but a cloned Mifare Classic can allow entry into buildings that use this system for security. ↑ "What is Oyster?". Transport for London. n.d. Retrieved 22 December 2013. ↑ "Join in the celebrations across the capital this summer with a limited edition Summer Oyster card" (Press release). Transport for London. 13 June 2012. Retrieved 11 September 2012. ↑ http://nfctimes.com/news/transport-london-accept-bank-cards-throughout-network-2012 "Transport for London wants to get out of the business of ... and issuing closed-loop Oyster cards ..."
↑ "Projects and Planning Panel, Project Monitoring papers" (PDF). Transport for London. 9 January 2014. p. 12. Retrieved 3 January 2014. ↑ "Oyster card: The highs and lows of Oyster". Computer Weekly. 14 July 2008. Retrieved 10 August 2008. ↑ Gannon, Mark J. (April 2006). "Funding London Underground's investment programme" (PDF). Chartered Institute of Logistics and Transport. Archived from the original (PDF) on 25 July 2011. ↑ Vermeulen, Amanda (9 August 2008). "Oyster card contractor fired after £1m failures". Financial Times. London. Retrieved 10 August 2008. ↑ "TfL terminates Oyster contract". ZDNet. 8 August 2008. Retrieved 10 August 2008. 1 2 "TfL salvages Oyster brand in deal with EDS, Cubic". ZDNet. 19 November 2008. Retrieved 24 November 2008. ↑ "Oyster brand bought for £1m by Transport for London". BBC News. 12 April 2010. Retrieved 13 April 2010. ↑ MIFARE.net. "Easing travel in London's congested public transport network". ↑ Balaban, Dan (21 January 2010). "Transport for London to Discard Mifare Classic". NFC Times. Paris. ↑ "Foiling the Oyster card". SpyBlog. 16 February 2004. Archived from the original on 3 February 2006. ↑ Judge, Peter (22 May 2008). "Linux opens London's Oyster". Zdnet. Retrieved 13 March 2011. ↑ "Conditions of Carriage" (PDF). Transport for London. 8 September 2013. Retrieved 22 December 2013. ↑ "Oyster refunds & replacements". Transport for London. 27 March 2014. ↑ "Changes to Oyster card deposit from 17 May" (Press release). Transport for London. 22 April 2009. ↑ "Mayor confirms 2011 fares at level signalled last year and protects all free and concessionary travel" (Press release). Transport for London. 20 October 2010. ↑ "National Rail Enquiries – Oyster issued". ATOC. Retrieved 13 March 2011. ↑ "Fares 2013: Bus and tram". Transport for London. Retrieved 22 December 2013. 1 2 3 "Where you can use Oyster". Transport for London. Retrieved 22 May 2011. ↑ Transport for London. "Online Oyster FAQ question". Retrieved 24 April 2010. ↑ "Guide to using tickets and PAYG on buses outside London" (PDF). Transport for London. 31 October 2009. ↑ "Touching in and out". Transport for London. 2012. Retrieved 11 September 2012. 1 2 "Mayor announces Oysterisation of Thames Clippers river services" (Press release). Transport for London. 23 November 2009. Retrieved 22 December 2013. ↑ "Out of Station Interchange (OSI)". Oyster and National Rail (independent guide). 26 May 2010. Retrieved 31 May 2010. 1 2 Transport for London. "Oyster online help". Retrieved 17 November 2007. ↑ "Application fee to be introduced for new Zip Oyster photocard applications from 1 September" (Press release). Transport for London. 23 July 2010. ↑ "Zip on board with Oyster" (Press release). Transport for London. 7 January 2008. ↑ 'London Connections' map published jointly by TfL and National Rail. ↑ 60+ London validity map published by TfL. ↑ Freedom pass validity map published by TfL. ↑ The British postal address system has many such anomalies. ↑ "Barclaycard OnePulse". Barclaycard. Retrieved 4 January 2010. ↑ "New deal brings Oyster and Barclaycard Visa onto one card" (Press release). Transport for London. 13 December 2006. ↑ "TfL shelves Oyster e-money". The Register. 9 May 2006. ↑ "London Tube Map". London Insider. November 2009. Retrieved 26 November 2009. ↑ Barney, Katharine (23 November 2009). "Travel revolution: Oyster rail will cut fares by 30%". London Evening Standard. 1 2 3 "One ticket for London as Oysterisation of rail and river confirmed" (Press release). Transport for London. 23 November 2009. ↑ "Silverlink lines under new management as Mayor launches London Overground" (Press release). Transport for London. 12 November 2007. 1 2 3 4 "Oyster pay as you go". Thames Clipper. 23 November 2009. Retrieved 26 November 2009. ↑ "FAQ". Emirates Air Line website. Retrieved 19 June 2012. ↑ "Fares on the Emirates Air Line" (PDF). Transport for London. June 2012. Retrieved 11 September 2012. 1 2 3 4 5 6 7 8 "TfL Single Fare Finder". Transport for London. August 2014. Retrieved 1 August 2014. ↑ "What discounts do I get?". Disabledpersons-railcard.co.uk. Retrieved 13 March 2011. ↑ "Mayor's 'cheap oil deal' slammed". BBC News. 13 September 2006. Retrieved 25 January 2008. ↑ "Johnsons Clash Over Half-Priced Fares". Mayorwatch.co.uk. 19 August 2008. Retrieved 13 March 2011. ↑ Transport for London – Big savings in 2006 by switching from cash for single journeys to Oyster Archived 7 March 2006 at the Wayback Machine. ↑ Mayor of London – Plane, Train and Oyster. 6 March 2007. ↑ TfL – Discounted daily price capping – Railcards. 8 February 2008. Archived 29 January 2008 at the Wayback Machine. 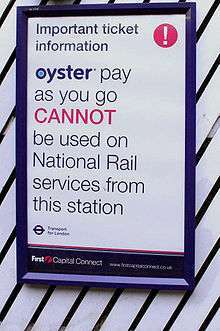 ↑ National Rail – Oyster Pay as you go (PAYG) on National Rail Archived 28 November 2006 at the Wayback Machine. ↑ Transport for London (19 November 2007). "TfL welcomes Oyster on London Midland services". Press Release. Archived from the original on 24 November 2007. Retrieved 19 November 2007. ↑ "All change at Watford Junction". The Watford Observer. 12 November 2007. Retrieved 17 November 2007. ↑ "London Midland admits error". The Watford Observer. 15 November 2007. Retrieved 19 November 2007. ↑ Lydall, Ross (12 January 2005). "New row over Oyster card". Evening Standard. Retrieved 10 August 2008. ↑ "Train operators' Oyster acceptance welcomed". TfL. 31 January 2007. Archived from the original on 18 May 2008. Retrieved 10 August 2008. ↑ Waugh, Paul (12 May 2008). "Boris plans to 'Oysterise' overground rail services by next May". Evening Standard. Retrieved 10 August 2008. ↑ "Watchdog fury at Oyster delay". 12 May 2009. ↑ "You Are Leaving Zone 2: Please Have Your Exit Visa Ready". The Londonist. 16 November 2009. Retrieved 19 November 2009. ↑ "Oyster PAYG On National Rail From 2 Jan". London Reconnections. 13 November 2009. Retrieved 4 January 2010. ↑ "London Tube Workers Vote to Strike". The Wall Street Journal. 11 August 2010. Retrieved 20 August 2010. ↑ Transport for London. "National Rail | Transport for London". Retrieved 13 December 2012. ↑ "Oyster Pay As You Go on Heathrow Connect – a Freedom of Information request to Transport for London – WhatDoTheyKnow:". Whatdotheyknow.com. 11 January 2012. Retrieved 12 January 2012. ↑ "New fares - Transport for London". tfl.gov.uk. Retrieved 2015-11-27. ↑ "Contactless payment". Transport for London. 2012. Retrieved 11 September 2012. ↑ Balaban, Dan (24 February 2011). "Transport for London to Accept Bank Cards on Entire Network in 2012". NFC times. Retrieved 7 March 2011. 1 2 Transport for London leaflet "Contactless travel"
↑ Transport for London (8 June 2015). "TfL to accept Apple Pay on public transport". Transport for London. Retrieved 13 June 2015. ↑ Scullion, Aaron (25 September 2003). "Smart cards track commuters". BBC News. Retrieved 4 February 2011. ↑ Gaby Hinsliff, political editor (16 March 2008). "MI5 seeks powers to trawl records in new terror hunt". The Guardian. UK. Retrieved 13 March 2011. ↑ Matt Stephens (13 February 2005). "The Oyster Gotcha". Retrieved 17 November 2007. ↑ Mendick, Robert (6 June 2008). "Archbishop's PA branded a fare dodger for 20p bus fare slip-up". Evening Standard. London. Retrieved 19 November 2009. ↑ Moore-Bridger, Benedict (17 April 2008). "Student gets criminal record for sake of 90p". Evening Standard. London. Retrieved 19 November 2009. ↑ "Court threat over £1.20 bus fare". BBC News. 20 October 2005. ↑ "Fine for 90p Oyster error quashed". BBC News. 15 August 2008. Retrieved 19 November 2009. ↑ Pidgeon, Caroline (25 February 2011). "News from Caroline Pidgeon – Oyster overcharging at a station near you". London Assembly Press Release. Retrieved 7 March 2011. ↑ Jones, Alan (7 January 2011). "Rail passengers 'ripped off' by Oyster card system". The Independent. London. Retrieved 7 March 2011. ↑ Edwards, Tom (reporter) (25 February 2011). Overcharge possibility 'a drawback' of Oyster card. BBC London. Archived from the original (iPlayer/FLV) on 28 February 2011. Retrieved 7 March 2011. ↑ "All go free in Oyster cards fiasco". Evening Standard. 12 July 2008. ↑ "Thousands go free on Tube as Oyster breaks down again". Evening Standard. 25 July 2008. Retrieved 25 July 2008. ↑ Advertising Standards Authority – ASA Adjudication: Objections to four posters for the Oyster card, a ticket for travel within London. ↑ House of Commons Transport Committee (2008). Ticketing and Concessionary Travel on Public Transport. The Stationery Office. p. 16. ISBN 978-0-215-51449-3. Retrieved 4 January 2009. ↑ "Our Year". Annual Review 2006. London TravelWatch. 2006. p. 11. Archived from the original (PDF) on 14 October 2007. Retrieved 6 March 2008. But the non-availability of Oyster’s pay-as-you-go ‘electronic purse’ facility on most National Rail routes has caused widespread confusion to passengers, many of whom have been charged penalty fares as a result. We have pressed the train companies to publicise their rules more effectively, and to be more sympathetic in their treatment of honest travellers who break them unknowingly. ↑ Roger Evans (3 August 2008). "Oyster cards at Romford Station". Retrieved 4 January 2010. ↑ Jonathan Moyes (8 February 2008). "Anger over Oyster card station 'snub'". Waltham Forest Guardian. Retrieved 6 March 2008. Wood Street in Walthamstow, Highams Park and Chingford on the Chingford to Liverpool Street line(...) do not currently have Oyster card readers(...) despite Oyster machines being installed in stations from Liverpool Street to Walthamstow Central on the same line. 1 2 "Oyster card absence branded a disgrace". Romford Recorder. 1 August 2008. Archived from the original on 30 April 2009. Retrieved 12 August 2008. ↑ "Campaign pushes to install Oyster card readers". 19 August 2008: Total Essex. Retrieved 4 January 2010. ↑ "Using Oyster to pay-as-you-go on National Rail services". Transport for London. Archived from the original on 10 August 2007. Retrieved 19 August 2007. ↑ "Map of Oyster Pay as you go on National Rail" (PDF). National Rail. Archived from the original (PDF) on 28 November 2006. Retrieved 30 December 2006. Also available from TfL website "Map of Oyster Pay as you go on National Rail" (PDF). Transport for London. Retrieved 19 August 2007. ↑ "Oyster card hack to be unveiled". BBC News. 21 July 2008. Retrieved 21 July 2008. ↑ Schneier, Bruce (7 August 2008). "Why being open about security makes us all safer in the long run". The Guardian. London. ↑ Gordillo, Fabio (2006). "The value of automated fare collection data for transit planning: an example of rail transit OD matrix estimation". ↑ Chan, Joanne (2007). "Rail transit OD matrix estimation and journey time reliability metrics using automated fare data". ↑ Seaborn, Catherine (2008). "Application of Smart Card Fare Payment Data to Bus Network Planning in London, UK". ↑ Zureiqat, Hazem (2008). "Fare Policy Analysis for Public Transport: A Discrete‐Continuous Modeling Approach Using Panel Data" (PDF). ↑ Frumin, Michael (2010). "Automatic Data for Applied Railway Management: Passenger Demand, Service Quality Measurement, and Tactical Planning on the London Overground Network" (PDF).